Water Heater Anodes manufactured by Galvotec Alloys, Inc.
Water Heater Anodes manufactured by Galvotec Alloys, Inc. certified to NSF / ANSI Standard 61 for use in potable water systems. 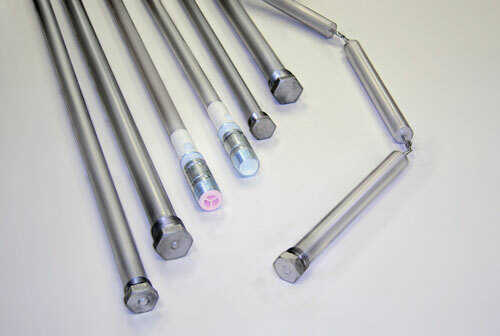 The SuperRODTM Product line of extruded magnesium rod is the key component of a water heater anode. Water Heater Anodes are available with integrated standard hex-head caps as well as AOD (Anode Outlet Device) type fittings. Also available are "linked-anodes" which are designed for installation in tight fitting areas. Anode lengths are dependant on water heater manufacturer's specifications. Anodes are available in diameters of 0.500, 0.675, 0.700, 0.750, 0.840, 0.900, 1.050, 1.315 inches. (Custom anode diameters and lengths are available upon request). You'll need the free acrobat viewer to browse our brochures and catalogs.